US fast-food company Burger King has explained its Twitter account was hacked, after its profile picture was changed to a McDonald's logo. The picture on the twitter account showed Fish McBites and a few posts contained racial slurs, obscenities as well as references to drugs. The firm says Twitter have suspended the account @BurgerKing and has not tweeted since 13:15 EST (18:15 GMT). Burger King says it will post an apology on its Facebook page. The twitter account tweeted that the company had been sold to rival burger chain McDonald's. "We just got sold to McDonald's! Look for McDonald's in a hood near you," one post read. It also posted messages such as: "If I catch you at a Wendys, we're fightin!" The tweets stopped after an hour. 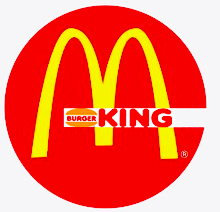 McDonald's tweeted in response to the hack: "We empathize with our @BurgerKing counterparts. Rest assured, we had nothing to do with the hacking." It is not known who was responsible for the breach.